EDITOR’S NOTE: In a previous post, our dear friend Jackie Barber told the inspiring story of how she is overcoming the dreaded Guillain Barre Syndrome (GBS) that eighteen months ago left her completely paralyzed from neck to toe. Jackie’s story of true courage and determination, My Year with Guillain Barre Syndrome (aka GBS), was published on HelpingYouCare® on June 30, 2012. Now, at our request, Shirley Woods, our Senior Editor’s Sister, who is Jackie’s long-time friend and former colleague as Administrators of Broward County Schools, tells her story of the daily caregiving role she has played over the past 18 months in helping Jackie recover. Although Shirley modestly entitles her story, “Tea and Transportation,” her caregiving role truly involved much more. The importance of Shirley’s caregiving support has been underscored by Jackie, who says that Shirley’s extraordinary help, along with that of Jackie’s husband Joe, has been crucial to her recovery. Shirley’s story, we believe, will uplift you with an example of the true meaning of friendship. She shares some of what she has learned from this experience, which may help others who are helping to care for a friend or family member suffering from Guillain Barre Syndrome (GBS) or similar life-threatening challenges. Jackie Barber and I have been friends since our days of working together in the school system. 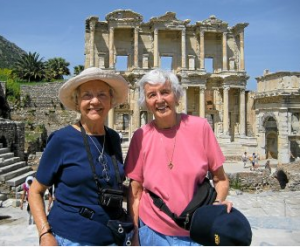 After we retired, we began new adventures of traveling together which we thoroughly enjoyed. Our fascination and joy of traveling lasted for 30 years or so until May of 2011 when Jackie came down with a serious immune system disorder called Guillain Barre Syndrome, (GBS). Jackie was in the hospital for 9 weeks undergoing treatment and therapy. Her husband, Joe, and I became instant “care givers” and we both became her “care giving” team. Joe is still working and we fell into the teamwork that was needed to support her during this time. It’s vitally important when a loved one is in the hospital, especially for an extended period of time, for those giving the care to jump in with support. Joe and I took turns getting to the hospital 3 times a day to oversee her meals. At first Jackie was unable to feed herself and we needed to be there to take care of overseeing her meals and to feed her. I cannot emphasize enough how important this is!! Someone definitely must oversee the patient who needs this care. As the days passed, she was able to feed herself and the three of us celebrated each step of progress. Joe and I kept this 3 a day vigil until she was able to come home. Joe then would oversee her three meals and also the extensive exercise regimen that was necessary for her to pursue. I would come over every morning with honeyed tea that we both enjoyed. I would oversee what she needed during the day which included, along with the tea, transportation to doctors’ appointments, therapy sessions, taking her on her errands, and walking with her when she needed her daily exercising, all that needed to be taken care of during her recuperation time. Joe would take over and see that she had his oversight when he came home, along with helping her with her continuing exercise. It is important while the patient is in the hospital that the hospital staff know that someone is there monitoring the care. After leaving the hospital it is very important that someone accompany the patient to doctors’ appointments. Two ears are better than one in understanding the intent of the doctor. In a final summary regarding the “care giver.” It’s very important that the caregiver takes excellent care of him/herself by getting plenty of rest so as not to bring any stress into the presence of the patient. There must always be an atmosphere of love, caring, warmth and support. It’s also very important to maintain and sustain one’s own health and support as caregiver…and to keep aware of the importance of cleanliness by washing and sanitizing their hands often. More and more Jackie has been able to do things for herself. She began to be able to drive, and we all rejoiced with her and celebrated each step of progress. She thrived under the support she received from her “team.” Through it all, she was dedicated to do all that she could for her own healing and regeneration. Amazingly, she kept her positive mindset and good disposition. She was the one who pushed us to keep pushing her. We are all looking forward to her complete recovery. Joe was her prime support and what a beautiful job he did. He was always right there doing all that he could for her. I was the second in line with….tea and transportation. Shirley Woods holds an Ed.D in Education. She enjoyed a successful career as a teacher and assistant principal at Northeast High School in Ft. Lauderdale, Florida. She retired after 30 years of service in the Broward County School system. Her retirement days have been spent attending workshops, traveling, and doing some writing. She and her long-time friend Jackie Barber did a great deal of traveling over the world in the 100 countries mentioned in Dr. Barber’s biography above. The traveling stopped abruptly in May of 2011 when her friend Jackie came down with a serious case of Guillain Barre Syndrome. Shirley has written and contributed to HelpingYouCare® her story (above) of serving as a caregiver to her friend Jackie over the past 18 months. She shares what she has learned from this experience, which may help others who are helping to care for a friend or family member suffering from Guillain Barre Syndrome (GBS) or similar life-threatening challenges. Copyright © 2012 Shirley A. Woods. Published by HelpingYouCare® with the author’s permission.